Color(s): Brown, Orange or Black with white markings, roan, or spotting. Solid brown or black head. Originating in the Northeastern part of the Netherlands in a province called Friesland, the Stabyhoun is a versatile breed that was used as both watchdog and hunter. They are quite rare, with only approximately 3500 known to be in existence today. Although this breed is prized by Dutch sportsmen, it has yet to gain popularity outside of the Netherlands. The Stabyhoun is sturdily built and possesses great stamina and power. This breed is a member of the Sporting Group due to their abilities in pointing, hunting, retrieving, and agility. This is such a rare breed in the United States that the first litter was not recorded until 1994. 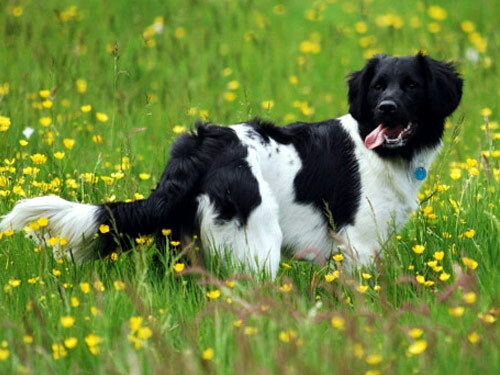 Stabyhoun's are a devoted and loyal companion that is excellent with children and other pets. They exhibit patience, are friendly with people they know, but are reserved with strangers. They are protective of their family, territory, and livestock, but are never vicious. This well-rounded breed makes a perfect companion, excellent watch, and avid hunting partner. The Stabyhoun is extremely affectionate and is slowly steadily gaining popularity in the United States for their pleasing personality. The Stabyhoun breed is quite fastidious and does not require much grooming. Regular brushing will keep the coat from becoming tangled with thorough brushing being necessary during seasonal shedding. Bathing should only be done when absolutely necessary to avoid damaging the coat. The Stabyhoun is a healthy breed due to its rarity and carefully selected breedings. The Stabyhoun breed's cooat is sleek and long over the body. The coat on the head is short, while the coat on the breeches and back of forelegs is bushy. There is feathering on the ears. The Stabyhoun sheds heavily twice a year. The Stabyhoun is intelligent and highly trainable. Training must be done with fairness, firmness, and consistency. The Stabyhoun excels in agility, triathlon, fly-ball, retrieving, hunting, pointing, and frisbee. The Stabyhoun is not recommended for apartment living. They require a high level of exercise and thrive on having a job to do. They enjoy daily walks, playing in a large securely fenced yard, performing duties in a rural setting, or hunting.